What, if anything, makes the pain increase? Physical medicine and rehabilitation employs diverse physical techniques such as thermal agents and electrotherapy, as well as therapeutic exercise and behavioral therapy, alone or in tandem with interventional techniques and conventional pharmacotherapy to treat pain, usually as part of an interdisciplinary or multidisciplinary program. The Center for Disease Control recommends that physical therapy and exercise can be prescribed as a positive alternative to opioids for decreasing one's pain in multiple injuries, illnesses, or diseases. This can include chronic low back pain, osteoarthritis of the hip and knee, or fibromyalgia. Exercise alone or with other rehabilitation disciplines (such as psychologically based approaches) can have a positive effect on reducing pain. In addition to improving pain, exercise also can improve one's well-being and general health. Physical activity interventions, such as tai chi, yoga and Pilates, promote harmony of the mind and body through total body awareness. These ancient practices incorporate breathing techniques, meditation and a wide variety of movements, while training the body to perform functionally by increasing strength, flexibility, and range of motion. Physical activity and exercise may improve chronic pain (pain lasting more than 12 weeks), and overall quality of life, while minimizing the need for pain medications. Transcutaneous electrical nerve stimulation has been found to be ineffective for lower back pain, however, it might help with diabetic neuropathy. Studies have demonstrated the usefulness of cognitive behavioral therapy in the management of chronic low back pain, producing significant decreases in physical and psychosocial disability. CBT is significantly more effective than standard care in treatment of people with body-wide pain, like fibromyalgia. Evidence for the usefulness of CBT in the management of adult chronic pain is generally poorly understood, due partly to the proliferation of techniques of doubtful quality, and the poor quality of reporting in clinical trials. The crucial content of individual interventions has not been isolated and the important contextual elements, such as therapist training and development of treatment manuals, have not been determined. The widely varying nature of the resulting data makes useful systematic review and meta-analysis within the field very difficult. For children and adolescents, a review of RCTs evaluating the effectiveness of psychological therapy for the management of chronic and recurrent pain found that psychological treatments are effective in reducing pain when people under 18 years old have headaches. This beneficial effect may be maintained for at least three months following the therapy. [needs update] Psychological treatments may also improve pain control for children or adolescents who experience pain not related to headaches. It is not known if psychological therapy improves a child or adolescents mood and the potential for disability related to their chronic pain. Morphine is the gold standard to which all narcotics are compared. Semi-synthetic derivatives of morphine such as hydromorphone (Dilaudid), oxymorphone (Numorphan, Opana), nicomorphine (Vilan), hydromorphinol and others vary in such ways as duration of action, side effect profile and milligramme potency. Fentanyl has the benefit of less histamine release and thus fewer side effects. It can also be administered via transdermal patch which is convenient for chronic pain management. In addition to the intrathecal patch and injectable Sublimaze, the FDA has approved various immediate release fentanyl products for breakthrough cancer pain (Actiq/OTFC/Fentora/Onsolis/Subsys/Lazanda/Abstral). 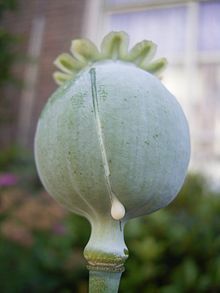 Oxycodone is used across the Americas and Europe for relief of serious chronic pain; its main slow-release formula is known as OxyContin, and short-acting tablets, capsules, syrups and ampules are available making it suitable for acute intractable pain or breakthrough pain. Diamorphine, methadone and buprenorphine are used less frequently. Pethidine, known in North America as meperidine, is not recommended[by whom?] for pain management due to its low potency, short duration of action, and toxicity associated with repeated use. Pentazocine, dextromoramide and dipipanone are also not recommended in new patients except for acute pain where other analgesics are not tolerated or are inappropriate, for pharmacological and misuse-related reasons. In some countries potent synthetics such as piritramide and ketobemidone are used for severe pain, and tapentadol is a newer agent introduced in the last decade. *The long-lasting version of OxyContin was a major contributor of the opioid epidemic. The other major group of analgesics are nonsteroidal anti-inflammatory drugs (NSAID). They work by inhibiting the release of prostaglandins, which cause inflammatory pain. Acetaminophen/paracetamol is not always included in this class of medications. However, acetaminophen may be administered as a single medication or in combination with other analgesics (both NSAIDs and opioids). The alternatively prescribed NSAIDs such as ketoprofen and piroxicam have limited benefit in chronic pain disorders and with long-term use are associated with significant adverse effects. The use of selective NSAIDs designated as selective COX-2 inhibitors have significant cardiovascular and cerebrovascular risks which have limited their utilization. Common NSAIDs include aspirin, ibuprofen, and naproxen. Some antidepressant and antiepileptic drugs are used in chronic pain management and act primarily within the pain pathways of the central nervous system, though peripheral mechanisms have been attributed as well. They are generally used to treat nerve brain that results form injury to the nervous system. Neuropathy can be due to chronic high glood sugar levels (diabetic neuropathy); and viruses, such as shingles; phantom limb pain; or post-stroke pain. These mechanisms vary and in general are more effective in neuropathic pain disorders as well as complex regional pain syndrome. A common anti-epileptic drug is gabapentin, and an example of an antidepressant would be amitriptyline. Chronic pain is one of the most commonly cited reasons for the use of medical marijuana. [unreliable source?] A 2012 Canadian survey of participants in their medical marijuana program found that 84% of respondents reported using medical marijuana for the management of pain. The medical treatment of pain as practiced in Greece and Turkey is called algology (from the Greek άλγος, algos, "pain"). The Hellenic Society of Algology and the Turkish Algology-Pain Society are the relevant local bodies affiliated to the International Association for the Study of Pain (IASP). Consensus in evidence-based medicine and the recommendations of medical specialty organizations establish the guidelines which determine the treatment for pain which health care providers ought to offer. For various social reasons, persons in pain may not seek or may not be able to access treatment for their pain. The Joint Commission, which has long recognized nonpharmacological approaches to pain, emphasizes the importance of strategies needed to facilitate both access and coverage to nonpharmacological therapies. Users of nonpharmacological therapy providers for pain management generally have lower insurance expenditures than those who did not use them. At the same time, health care providers may not provide the treatment which authorities recommend. The need for an informed strategy including all evidence-based comprehensive pain care is demonstrated to be in the patients' best interest. Healthcare providers' failure to educate patients and recommend nonpharmacologic care should be considered unethical. Young children can indicate their level of pain by pointing to the appropriate face on a children's pain scale. ^ Main CJ, Spanswick CC (2000). Pain management: an interdisciplinary approach. Churchill Livingstone. ISBN 978-0-443-05683-3. ^ Thienhaus O, Cole BE (2002). "The classification of pain". In Weiner RS (ed.). Pain management: A practical guide for clinicians. CRC Press. p. 29. ISBN 978-0-8493-0926-7. ^ Pasero C, McCaffery M. Pain: clinical manual. St. Louis: Mosby; 1999. ISBN 0-8151-5609-X. ^ a b c d e f g h i j k l m n Consumer Reports (April 28, 2016). "Pain Relief: What You Need to Know". Consumer Reports. Retrieved 26 May 2016. ^ Geertzen JH, Van Wilgen CP, Schrier E, Dijkstra PU (2006). "Chronic pain in rehabilitation medicine". Disability and Rehabilitation. 28 (6): 363–7. doi:10.1080/09638280500287437. PMID 16492632. ^ a b c d Dowell, Deborah; Haegerich, Tamara M.; Chou, Roger (2016). "CDC Guideline for Prescribing Opioids for Chronic Pain — United States, 2016". MMWR. Recommendations and Reports. 65: 1–49. doi:10.15585/mmwr.rr6501e1er. ISSN 1057-5987. ^ a b Geneen LJ, Moore RA, Clarke C, Martin D, Colvin LA, Smith BH, et al. (Cochrane Pain, Palliative and Supportive Care Group) (April 2017). "Physical activity and exercise for chronic pain in adults: an overview of Cochrane Reviews". The Cochrane Database of Systematic Reviews. 4: CD011279. doi:10.1002/14651858.CD011279.pub3. PMC 5461882. PMID 28436583. ^ "Chronic Pain: Symptoms, Diagnosis, & Treatment". NIH MedlinePlus the Magazine. Retrieved 2019-03-12. ^ Dubinsky RM, Miyasaki J (January 2010). "Assessment: efficacy of transcutaneous electric nerve stimulation in the treatment of pain in neurologic disorders (an evidence-based review): report of the Therapeutics and Technology Assessment Subcommittee of the American Academy of Neurology". Neurology. 74 (2): 173–6. doi:10.1212/WNL.0b013e3181c918fc. PMID 20042705. ^ Madsen MV, Gøtzsche PC, Hróbjartsson A (January 2009). "Acupuncture treatment for pain: systematic review of randomised clinical trials with acupuncture, placebo acupuncture, and no acupuncture groups". BMJ. 338: a3115. doi:10.1136/bmj.a3115. PMC 2769056. PMID 19174438. ^ Chou R, Huffman LH (October 2007). "Nonpharmacologic therapies for acute and chronic low back pain: a review of the evidence for an American Pain Society/American College of Physicians clinical practice guideline". Ann. Intern. Med. 147 (7): 492–504. doi:10.7326/0003-4819-147-7-200710020-00007. PMID 17909210. ^ Yousefi-Nooraie R, Schonstein E, Heidari K, et al. (2008). Yousefi-Nooraie R (ed.). "Low level laser therapy for nonspecific low-back pain". Cochrane Database Syst Rev (2): CD005107. doi:10.1002/14651858.CD005107.pub4. PMID 18425909. ^ Boswell MV, Trescot AM, Datta S, Schultz DM, Hansen HC, Abdi S, Sehgal N, Shah RV, Singh V, Benyamin RM, Patel VB, Buenaventura RM, Colson JD, Cordner HJ, Epter RS, Jasper JF, Dunbar EE, Atluri SL, Bowman RC, Deer TR, Swicegood JR, Staats PS, Smith HS, Burton AW, Kloth DS, Giordano J, Manchikanti L (2007). "Interventional techniques: evidence-based practice guidelines in the management of chronic spinal pain" (PDF). Pain Physician. 10 (1): 7–111. PMID 17256025. Archived from the original (PDF) on 2012-09-12. ^ Turner JA, Clancy S (April 1988). "Comparison of operant behavioral and cognitive-behavioral group treatment for chronic low back pain". Journal of Consulting and Clinical Psychology. 56 (2): 261–6. doi:10.1037/0022-006x.56.2.261. PMID 2967314. ^ Eccleston C (August 2011). "Can 'ehealth' technology deliver on its promise of pain management for all?". Pain. 152 (8): 1701–2. doi:10.1016/j.pain.2011.05.004. PMID 21612868. ^ a b c Williams AC, Eccleston C, Morley S (November 2012). "Psychological therapies for the management of chronic pain (excluding headache) in adults". The Cochrane Database of Systematic Reviews. 11: CD007407. doi:10.1002/14651858.CD007407.pub3. PMID 23152245. ^ a b Eccleston C, Palermo TM, de Williams AC, Lewandowski A, Morley S, Fisher E, Law E (December 2012). "Psychological therapies for the management of chronic and recurrent pain in children and adolescents". The Cochrane Database of Systematic Reviews. 12: CD003968. doi:10.1002/14651858.CD003968.pub3. PMC 3715398. PMID 23235601. ^ Elkins G, Jensen MP, Patterson DR (July 2007). "Hypnotherapy for the management of chronic pain". The International Journal of Clinical and Experimental Hypnosis. 55 (3): 275–87. doi:10.1080/00207140701338621. PMC 2752362. PMID 17558718. ^ Accardi MC, Milling LS (August 2009). "The effectiveness of hypnosis for reducing procedure-related pain in children and adolescents: a comprehensive methodological review". Journal of Behavioral Medicine. 32 (4): 328–39. doi:10.1007/s10865-009-9207-6. PMID 19255840. ^ American Psychological Association (2 July 2004). "Hypnosis for the relief and control of pain". American Psychological Association. Retrieved 29 April 2013. ^ a b Jensen M, Patterson DR (February 2006). "Hypnotic treatment of chronic pain". Journal of Behavioral Medicine. 29 (1): 95–124. doi:10.1007/s10865-005-9031-6. PMID 16404678. ^ Reiner K, Tibi L, Lipsitz JD (February 2013). "Do mindfulness-based interventions reduce pain intensity? A critical review of the literature". Pain Medicine. 14 (2): 230–42. doi:10.1111/pme.12006. PMID 23240921. ^ "WHO - WHO's cancer pain ladder for adults". WHO. ^ Reynolds LA, Tansey EM, eds. (2004). Innovation in pain management : the transcript of a Witness seminar held by the Wellcome Trust Centre for the History of Medicine at UCL, London, on 12 december 2002. London: Wellcome Trust Centre for the History of Medicine at University College London. ISBN 978-0-85484-097-7. ^ Dunn KM, Saunders KW, Rutter CM, et al. (January 2010). "Overdose and prescribed opioids: Associations among chronic non-cancer pain patients". Ann. Intern. Med. 152 (2): 85–92. doi:10.7326/0003-4819-152-2-201001190-00006. PMC 3000551. PMID 20083827. ^ Daubresse M, Chang HY, Yu Y, Viswanathan S, Shah ND, Stafford RS, Kruszewski SP, Alexander GC (October 2013). "Ambulatory diagnosis and treatment of nonmalignant pain in the United States, 2000-2010". Medical Care. 51 (10): 870–8. doi:10.1097/MLR.0b013e3182a95d86. PMC 3845222. PMID 24025657. ^ Carinci AJ, Mao J (February 2010). "Pain and opioid addiction: what is the connection?". Curr Pain Headache Rep. 14 (1): 17–21. doi:10.1007/s11916-009-0086-x. PMID 20425210. ^ Starrels JL, Becker WC, Alford DP, Kapoor A, Williams AR, Turner BJ (June 2010). "Systematic review: treatment agreements and urine drug testing to reduce opioid misuse in patients with chronic pain". Ann. Intern. Med. 152 (11): 712–20. doi:10.7326/0003-4819-152-11-201006010-00004. PMID 20513829. ^ King SA (2010). "Guidelines for prescribing opioids for chronic pain". Psychiatr Times. 27 (5): 20. ^ Munir MA, Enany N, Zhang JM (January 2007). "Nonopioid analgesics". The Medical Clinics of North America. 91 (1): 97–111. doi:10.1016/j.mcna.2006.10.011. PMID 17164106. ^ Ballantyne JC (November 2006). "Opioids for chronic nonterminal pain". Southern Medical Journal. 99 (11): 1245–55. doi:10.1097/01.smj.0000223946.19256.17. PMID 17195420. ^ Jackson KC (2006). "Pharmacotherapy for neuropathic pain". Pain Practice. 6 (1): 27–33. doi:10.1111/j.1533-2500.2006.00055.x. PMID 17309706. ^ "Medical Marijuana and Chronic Pain". www.truthonpot.com. TruthOnPot.com. 11 March 2013. Retrieved 28 April 2013. ^ Lucas P (January 2012). "It can't hurt to ask; a patient-centered quality of service assessment of health canada's medical cannabis policy and program". Harm Reduct J. 9 (2): 2. doi:10.1186/1477-7517-9-2. PMC 3285527. PMID 22214382. ^ Joy, J. E.; Watson Jr., S. J.; Benson Jr., J. A. (1999). Marijuana and Medicine: Assessing the Science Base. Institute of Medicine. doi:10.17226/6376. ISBN 978-0-309-07155-0. PMID 25101425. Retrieved 3 May 2013. ^ Zogopoulos P, Vasileiou I, Patsouris E, Theocharis SE (Feb 2013). "The role of endocannabinoids in pain modulation". Fundam Clin Pharmacol. 27 (1): 64–80. doi:10.1111/fcp.12008. PMID 23278562. ^ Caraceni A, Zecca E, Martini C, De Conno F (June 1999). "Gabapentin as an adjuvant to opioid analgesia for neuropathic cancer pain". Journal of Pain and Symptom Management. 17 (6): 441–5. doi:10.1016/S0885-3924(99)00033-0. PMID 10388250. ^ "Ana Sayfa". Algoloji - Ağrı Derneği. ^ Schiller, Francis (1990). "The History of Algology, Algotherapy, and the Role of Inhibition". History and Philosophy of the Life Sciences. 12 (1): 27–49. JSTOR 23330469. PMID 2243924. ^ a b Tick H, Nielsen A, Pelletier KR, Bonakdar R, Simmons S, Glick R, Ratner E, Lemmon RL, Wayne P, Zador V (May 2018). "Evidence-Based Nonpharmacologic Strategies for Comprehensive Pain Care: The Consortium Pain Task Force White Paper". Explore. 14 (3): 177–211. doi:10.1016/j.explore.2018.02.001. PMID 29735382. ^ American Academy of Pediatrics (2001). "The Assessment and Management of Acute Pain in Infants, Children, and Adolescents". Pediatrics. 108 (3): 793–7. doi:10.1542/peds.108.3.793. PMID 11533354. ^ a b Weydert JA (2013). "The interdisciplinary management of pediatric pain: Time for more integration". Techniques in Regional Anesthesia and Pain Management. 17 (2013): 188–94. doi:10.1053/j.trap.2014.07.006. ^ a b c "Pediatric Pain Management" (PDF). American Medical Association. Retrieved March 27, 2014. ^ Wente SJ (2013). "Nonpharmacologic pediatric pain management in emergency departments: A systematic review of the literature". Journal of Emergency Nursing. 39 (2): 140–150. doi:10.1016/j.jen.2012.09.011. PMID 23199786. ^ Zagustin TK (2013). "The role of cognitive behavioral therapy for chronic pain in adolescents". PM&R. 5 (8): 697–704. doi:10.1016/j.pmrj.2013.05.009. PMID 23953015. ^ "Taking a Subspecialty Exam - American Board of Psychiatry and Neurology". Retrieved 2015-09-19. ^ Mayer EK, Ihm JM, Sibell DM, Press JM, Kennedy DJ (August 2013). "ACGME sports, ACGME pain, or non-ACGME sports and spine: which is the ideal fellowship training for PM&R physicians interested in musculoskeletal medicine?". PM & R : The Journal of Injury, Function, and Rehabilitation. 5 (8): 718–23, discussion 723–5. doi:10.1016/j.pmrj.2013.07.004. PMID 23953018. Diwan S, Staats P (January 2015). Atlas of Pain Medicine Procedures. McGraw Hill. ISBN 978-0-07-173876-7. Staats P, Wallace M (March 2015). Pain Medicine and Management: Just the Facts. McGraw Hill. ISBN 9780071817455. Fausett HJ, Warfield CA (2002). Manual of pain management. Hagerstwon, MD: Lippincott Williams & Wilkins. ISBN 978-0-7817-2313-8. Bajwa ZH, Warfield CA (2004). Principles and practice of pain medicine. New York: McGraw-Hill, Medical Publishing Division. ISBN 978-0-07-144349-4. Waldman SD (2006). Pain Management. Philadelphia: Saunders. ISBN 978-0-7216-0334-6. Daubresse M, Chang HY, Yu Y, Viswanathan S, Shah ND, Stafford RS, Kruszewski SP, Alexander GC (October 2013). "Ambulatory diagnosis and treatment of nonmalignant pain in the United States, 2000-2010". Medical Care. 51 (10): 870–8. doi:10.1097/MLR.0b013e3182a95d86. PMC 3845222. PMID 24025657. Uebel M (2015). Pain Control (Sage Encyclopedia of Pharmacology and Society, Sarah. E. Boslaugh ed.). Thousand Oaks, CA: Sage. pp. 1027–1029. ISBN 9781483350004. Graham SS (2015). The Politics of Pain Medicine: A Rhetorical-Ontological Inquiry. Chicago Scholarship Online. ISBN 9780226264059.